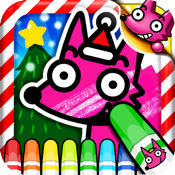 Have a joyful holiday season with Christmas Coloring Book! Santa Claus, The drummer boy, Rudolph the red-nosed reindeer and more! * Share the colored pages via Facebook and Twitter. * 12 color-crayons and 1 magic crayon included. Enjoy other kids apps from ‘Pink Fong’, too!